rivers below Richmond is thus a small fraction of the total area drained by this system. Runoff from the contiguous drainage area during the low-flow summer months represents a small fraction of the total river flow and has a negligible effect on the water quality in the watershed. The importance of the upstream pollutant loads was reported by HydroQual (1986). For example, in the James, the upstream ultimate BOD load is larger than any point source load, and the nitrogenous BOD (NBOD) is nearly equal in magnitude to several of the largest point source inputs. Similarly, the Appomattox River boundary load is significant relative to the Petersburg wastewater treatment plant discharge, the only significant point source input to this river. Further, the three point source inputs, the Richmond and Hopewell treatment plants and Allied-Hopewell, account for the major portion of the point source loads to the James. The nonpoint source runoff load was shown to be relatively small in comparison to the other inputs to the system (HydroQual, 1986). It should be pointed out that CSO loads might be significant inputs to the river system during wet weather conditions and might also be a factor in the sediment interactions. In view of the purpose of this study, CSOs are not included in this analysis. The CSO impacts are indirectly incorporated into the modeling analysis to the degree that they are a component in the sediment oxygen demand rates determined by Hydro-Qual (1986). Figure 9-7 shows historical data of DO concentrations in the James estuary. The June 1971 survey shows that the river reach from Richmond to Hopewell was dominated by the waste discharges from and near Richmond. During that survey, the river was under a moderately high temperature and high flow. Consequently, the DO sag was carried downstream far enough (about 35 miles from Richmond) to merge with the Hopewell area discharges. Downstream from Hopewell, the DO concentrations started a slow recovery. In the lower estuary, from Mulberry Island (River Mile 27) to Old Point Comfort (River Mile 0), there were a number of large waste discharges. As a result of the strength of the tidal action combined with the massive amount of dilution water available, a rather steady DO level was measured. The DO levels seldom fell below 5.5 mg/L under the worst conditions, and the depression of DO due to waste stabilization by biological oxidation was usually less than 1 mg/L (Engineering Science, 1974). Figure 9-7 Spatial distribution of DO for the James estuary: (a) June 1971; (b) September 1971; (c) July 1976; and (d) July 1983. Sources: HydroQual, 1986; Lung, 1991. 1976. The DO sag level (below Richmond) improved slightly from the 1971 condition, although the sag was still below 5 mg/L. A mild recovery occurred until the wastes from the Hopewell area entered the river and depressed the DO concentration again, resulting in a second DO sag in the river. Such a two-sag DO profile has been consistently observed since the late 1970s. The low DO gradually increased downstream for a full recovery. Figure 9-8 Projected impact of point source phosphorus controls. Source: Lung, 1986. Reprinted with permission of the American Society of Civil Engineers. Copyright 1986.
cate that the minimum DO level was above 6 mg/L in September 1983, a sign of continuing improvement of the water quality. The impact from the Richmond area discharges has been significantly reduced following the treatment plant upgrades. Although the reduction of BOD5 loads from the POTWs was measured in the last 30 years, no appreciable reduction of nutrient loads was detected until the phosphate detergent ban in 1988. 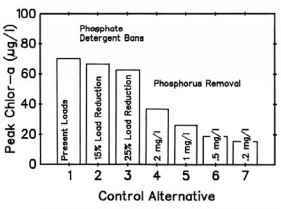 Prior to the Virginia phosphate detergent ban, Lung (1986) conducted a modeling study assessing the water quality benefit of point source phosphorus control in the James River basin. The model results are summarized in Figure 9-8, showing the peak phytoplankton chlorophyll levels predicted in the upper James estuary for various control alternatives ranging from a phosphate detergent ban to phosphorus removal. The model suggests that the reduction of chlorophyll in the water column due to the phosphate detergent ban would be minimal, while phosphorus removal at POTWs would offer reasonable reductions in phytoplankton biomass in the upper estuary. 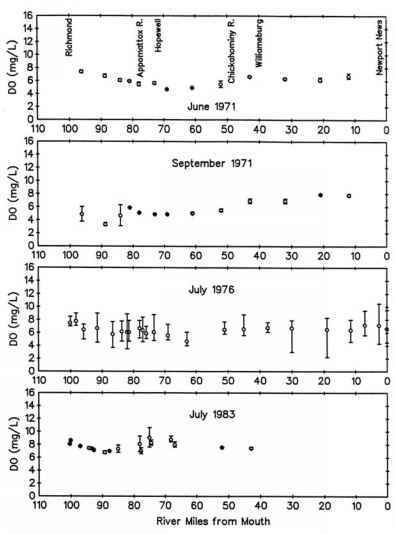 Figure 9-9 James River model calibrations for September 1983. Source: Lung and Testerman, 1989. Reprinted with permission of the American Society of Civil Engineers. Copyright 1989.
lation and wastewater flow data (ca. 1983) were used to compare water quality for summer low-flow and 7Q10 low-flow conditions simulated with three management scenarios: (1) primary effluent, (2) secondary effluent, and (3) existing wastewater loading. 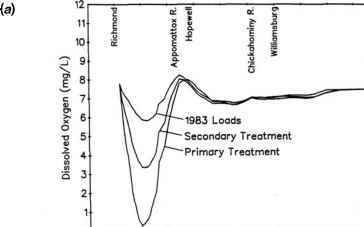 Water quality conditions for these alternatives were simulated using freshwater and wastewater flow data for 1983, a year characterized by 66 percent of the summer average flow (see Figure 9-3) of the James River (Figure 9-10). 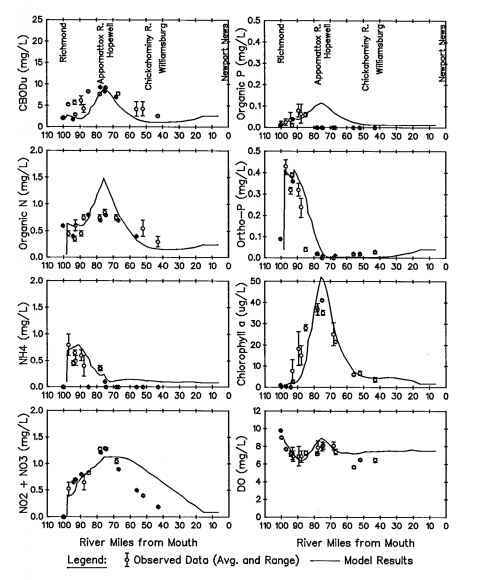 Figure 9-10 Comparison of simulated impact of primary, secondary, and existing 1983 effluent levels on DO: (a) summer 1983 conditions and (b) 7Q10 low-flow conditions. Source: Lung, 1991. Using the primary effluent assumption, under summer low-flow conditions, water quality is noticeably deteriorated in comparison to the 1983 calibration results. DO concentrations downstream of Richmond (River Mile 90) are computed to be near zero under the primary scenario. Using the secondary assumption, the significant reduction in BOD5 loading significantly improves DO between Richmond and Hopewell, Virginia. In comparison to the primary scenario, minimum monthly aver aged oxygen levels increase to almost 3.5 mg/L from less than 0.5 mg/L under the secondary effluent scenario. As shown with both observed data (Figure 9-9) and model simulations (Figure 9-10), the implementation of secondary and better treatment has resulted in significant improvements in the DO status of the estuary. 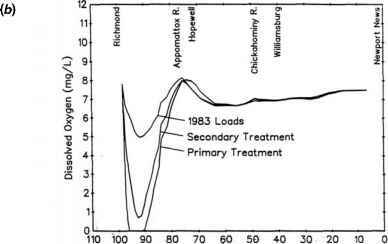 As demonstrated with the model, better-than-secondary treatment is required to achieve compliance with the water quality standard of 5 mg/L under extreme 7Q10 low-flow conditions (Figure 9-10) for DO downstream of Richmond. In contrast to the 1950s and 1960s, the occurrence of low-oxygen conditions has been virtually eliminated within the upper James River estuary. Additional improvements in water quality, in terms of reduced algal biomass and still greater improvements in DO levels, have been achieved as a result of advanced secondary levels of wastewater treatment for the Upper James River. Upgrades of wastewater treatment plants to secondary treatment in the 1970s and continued commitment to water quality-based pollution controls throughout the 1980s and 1990s have achieved a dramatic recovery for the James River. Instead of turkey vultures, residents of Richmond currently can gaze at blue herons, bald eagles, and ospreys circling overhead (Epes, 1992). Although passage of the Clean Water Act in 1972 was the most significant factor contributing to the comeback of the James, other factors contributing to improvements in wildlife habitat included the creation of a flood control reservoir in the early 1980s to stabilize flow, the ban of the insecticide DDT, and floods and hurricanes in the 1960s and 1970s. The ban on DDT allowed certain birds affected by egg shell thinning, including eagles and ospreys, to recover. 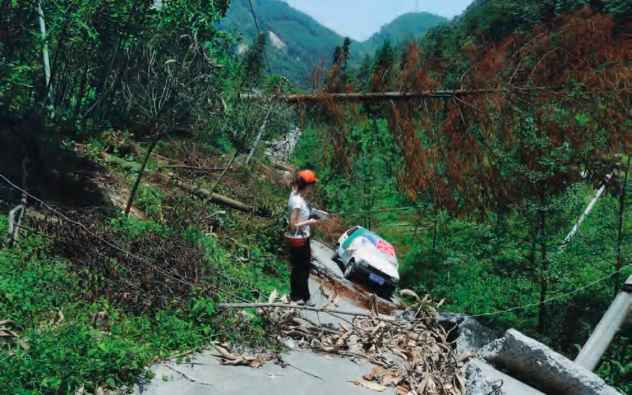 The floods and hurricanes contributed to habitat improvement by punching holes in several of the dams in the river, allowing migrating fish to pass through once more (Epes, 1992). Those holes, and subsequent man-made fish ladders, have allowed fish to swim farther upstream to spawn again. Above the falls, the return of smallmouth bass has made the upper James River one of the best smallmouth bass fisheries in the country. Below Richmond, abundant large-mouth bass attract the national Bassmasters fishing tournaments. Striped bass, an anadromous (saltwater-to-freshwater migrating) fish, has returned to the James due in part to a state harvesting moratorium in effect for several years in the Chesapeake Bay. In fact, a 25-pound striped bass was caught in 1992 near Williams Dam in Richmond (Epes, 1992). Fish-eating birds have also returned to the James River. In the 1970s, there were no bald eagles or ospreys nesting on the James River. In 1992, three pairs of bald eagles and six pairs of ospreys had reclaimed their historical nesting sites on the James (Bradshaw, 1992). Great blue herons boast about 200 pairs (Bradshaw, 1992). Birds began to return in the mid-1980s. Cattle egrets and double-crested cormorants extended their ranges to colonize the James, possibly due to reduction in available habitat elsewhere. In 1992, there were about 250 pairs of each overwintering in the region from Richmond to the Benjamin Harris bridge (Bradshaw, 1992). Cattle egrets eat reptiles and eels, and double-crested cormorants eat fish. These birds are no doubt responding to the increase in the stream quality for fish and other aquatic life now that wastewater discharges of organic and nutrient loads to the James River have been controlled.